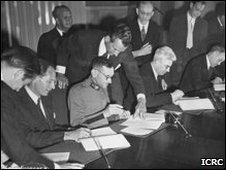 The Geneva Conventions are 60 years old on Wednesday, but the anniversary comes amid concern that respect for the rules of war is small. The three existing Geneva Conventions, which relate to the immunity of medical personnel on the battlefield and the treatment of prisoners of war, were extensively revised in 1949. The fourth Geneva Convention, which stipulates that warring parties have an obligation to protect civilians, was added. The fourth convention in particular was born out of the horrors of the World War II - not just the appalling atrocity of the concentration camps, but the deliberate starvation of the city of Leningrad, and the indiscriminate bombing of Dresden and Coventry. The conventions received widespread international support from the start, and today all 194 states have ratified them. Unfortunately, signatures on paper have not led to respect for the conventions, and research conducted by the International Committee of the Red Cross (ICRC) - which is the guardian of the conventions - shows that civilians suffer most in armed conflict. In World War I, the ratio of soldiers to civilians killed was 10 to one. In World War II it became 50-50, and today the figures are almost reversed - up to 10 civilians killed for every one soldier. Last year's brief war between Georgia and Russia is a case in point. In just a few days, several hundred civilians are believed to have lost their lives and tens of thousands were driven from their homes. Along both sides of the closed "administrative boundary line" between Georgia and the breakaway republic of South Ossetia, dozens of villages are abandoned, the houses burned or bombed. Mary Gelashvili, an elderly woman from the village of Tserenisi, has lost not just her house, which is destroyed, but her livelihood too. Her fields are along the boundary line, and she can no longer get to them. "No one should have the right to destroy my home," she says. Under international law she is absolutely right. 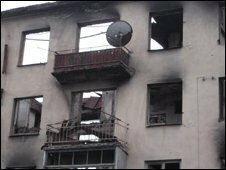 Indiscriminate damage to civilian life and property is forbidden. 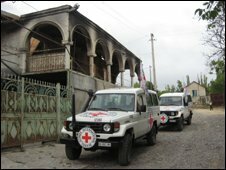 "It's true the Geneva Conventions didn't help these people very much," admits Florence Gillette, head of the ICRC office in the Georgian town of Gori. "The conventions actually state that all precautions should be taken to spare civilian lives and property, and not just lives and property but all infrastructure essential to survival. "That's part of the fourth Geneva Convention that all the parties to this conflict, the Russians and the Georgians, signed and ratified a long time ago." One problem the ICRC has, however, in trying to encourage respect for the conventions, is that modern conflicts are often fought not between two identifiable formal armies, but between and among a variety of armed groups, including informal militias and even criminal gangs. Last year's war between Russia and Georgia was classified by the ICRC as an international armed conflict. Nevertheless, local militias also took part in the fighting and are believed to have been responsible for at least some of the damage to civilian property. "Certain key concepts in today's armed conflicts have to be clarified," says ICRC President Jakob Kellenberger. "It would be desirable to further develop certain aspects of the law, particularly those related to non-international armed conflicts." The Red Cross insists the real problem with the conventions is not their lack of relevance to modern warfare, but the continued lack of respect for them. "That is the big question for all of us," admits Philip Spoerri, the ICRC's head of international law. "We have to find ways to enforce these rules." But enforcement is a very tricky issue. As guardian of the conventions and the world's single most important humanitarian agency, the ICRC has no power to enforce, and would not want it. "There, we have to turn to bodies like the International Criminal Court," Mr Spoerri adds. "Or the United Nations could enforce them, but of course we see there is not always the willingness to do so." At the same time, the ICRC also rejects the suggestions which came from the then Bush administration that the Geneva Conventions are not really applicable in the "War on Terror". "It is extremely significant that the new administration of President Obama reaffirmed US commitment to the conventions," says Mr Kellenberger. "We welcome that." Nevertheless, the Red Cross knows more needs to be done to encourage respect for the conventions, in particular to strengthen the protection of civilians, and work is under way at ICRC headquarters to find ways of doing that. In the meantime, Red Cross workers like Joyce Hood, a nurse in South Ossetia, are left to pick up the pieces of civilian lives shattered by conflict. 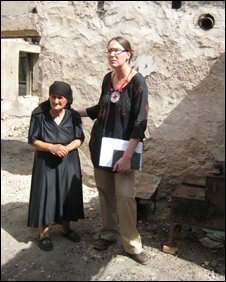 Ms Hood spends much of her time caring for five elderly people, the only remaining inhabitants of the now destroyed village of Satskheneti. "In almost all these situations it is the elderly, the very young, the vulnerable normal people that bear the brunt of conflict," she says. "They may not be injured by bullets but they suffer for a long time afterwards. They rarely get their life back to what it was before. "There are so many conflicts, and mostly internal conflicts, not massive wars like we used to see last century - little conflicts to the rest of the world but to these people it's enormous, their whole life is destroyed. "Their life is totally turned upside down, for nothing."